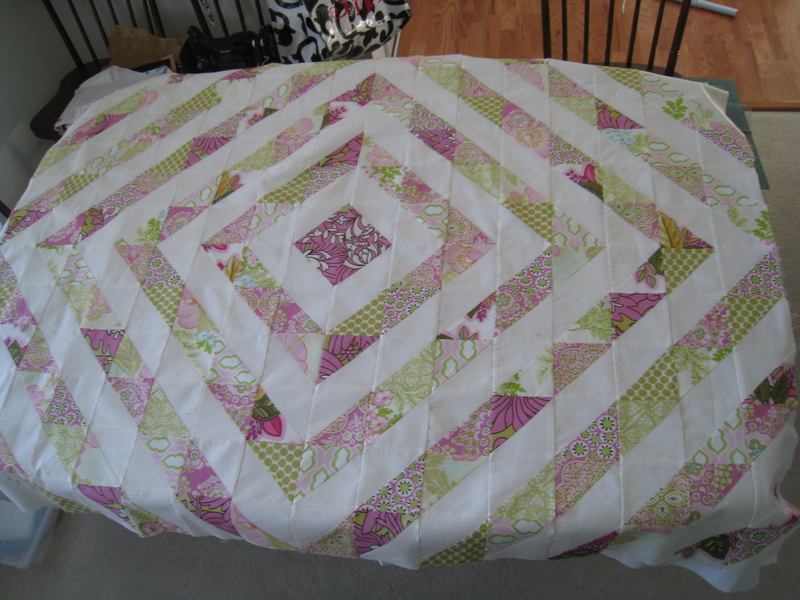 Pink and Green Quilt Top-Check! I’ve been meaning to post this for a week! I finished up the pink and green quilt top last Thursday (still have a long way to go before it’s done though) and have been trying to get pictures up since. We’ve got some big changes in our house (see our new furry addition) and I think this top may take me a little longer to quilt than I was hoping, but I’ll get there! Hank is so cute, he loves quilts. Halfway done, pinned to the wall. This entry was posted in quilts, WIP and tagged WIP. Bookmark the permalink. 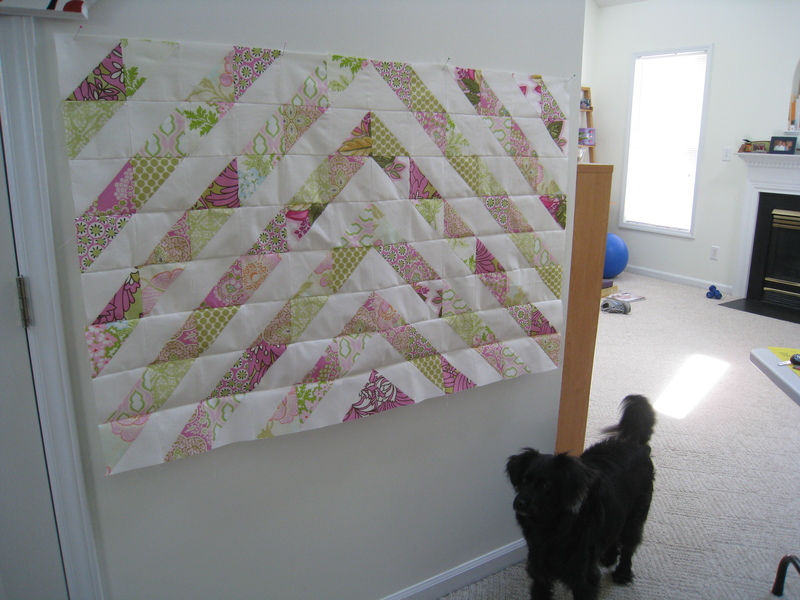 10 Responses to Pink and Green Quilt Top-Check! I love the colors you used, as well, I agree with Elizabeth pink and green are happy colors and the pattern complements great job!! I am a new quilter and have been looking for helpful sites and blog to share information, quilt patterns and fabric ideas. I found a great website where you can download quilt patterns. These ladies have unique and creative downloadable quilt patterns. In fact, they have a great selection of all types of quilt patterns, kits and just about everything. The site is http://www.toadusew.com. Pink and green is such a happy color combination! I love it! The top looks great! How are you planning on quilting it? I’m planning on echoing the diamonds. I think it will really let the quilt shine on it’s own-simple and elegant. 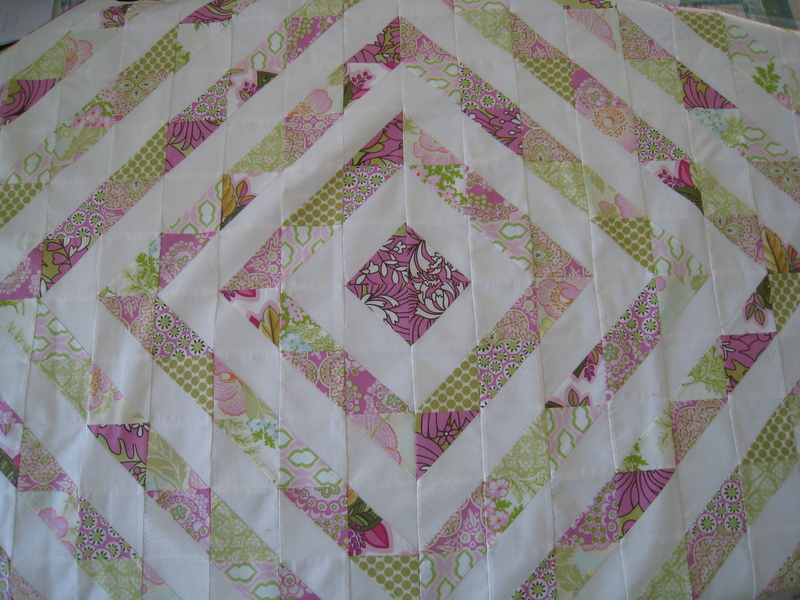 I love your quilt, how big are your squares and how many pink/green prints did you buy ? Also how much white fabric did you buy ? You have inspired me to start one ! It’s been quite the process! * I originally cut 5 in. squares of the pink/green prints and Kona Snow fabrics. Then, I did the half square triangle thing and sewed down 1/4 inch from the center, on each side. After pressing, they came out to be about 4 and 1/2 inch blocks. I believe I ended up with 192 blocks total. * As for how much fabric I bought…it’s been a changing number! I know I had three yards of the Kona snow and there isn’t much left over. I started with 4 1/2 yards of pink and green prints and eventually decided to add more. In the end I believe I had 8 pink and green prints, with a fat quarter of each. I love it! I especially love this block arrangement. And those pink and green colors really pop with the white in between. Hank looks like he is presenting it to us (like Vanna White) – what a cutie he is!